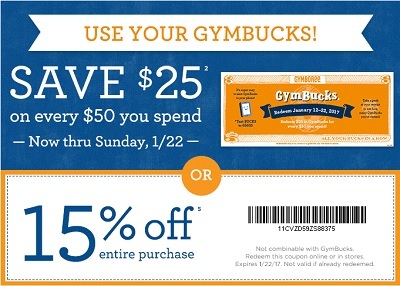 It's time to redeem your GymBucks right now at any U.S. Gymboree store location. Save $25 on every $50 you spend. Or, if you do not have GymBucks you can still save with printable coupon which allows you to receive 15% discount on your entire purchase. Source of the information is Gymboree. Offer is valid until January 22, 2017. For more details visit any U.S. Gymboree store location or U.S. Gymboree online.